Miyamae Kanako, a high school girl, who is allergic to boys, enrols in an all-girls school, hoping to find a female romantic partner. However, her ideal candidate, Shidou Mariya, turns out to be a mischievous cross-dressing boy, who together with his sarcastic maid Shinouji Matsurika, give Kanako really difficult times. Time passes and Kanako still fantasizes about her ideal female romantic partner(s), to no avail, alas. Living in the same room at the dormitory Mariya and his outspoken maid keep on challenging Kanako's sense of reality on a daily basis. 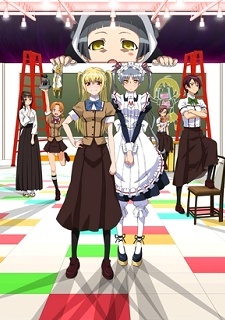 Watch Maria Holic Alive Episodes Online at Animegg.org. Maria Holic Alive is available in High Definition only through Animegg.org. Choose an episode below and start watching Maria Holic Alive in Subbed & Dubbed HD now.